After a loss this weekend, the Kilbourne Wolves got back on track by defeating The Delaware Pacers 10-6 Monday night (4/15). The win moves Kilbourne to a record of 8-2 overall on the season. The first half the Wolves appeared a bit out of sync with turnovers and penalties. They trailed Delaware 4-3 at the half. After halftime, it was a different story. The Wolves rolled up 7 goals in the second half to take control of the game. The defense clamped down on the Pacers and the offense began to click and also converted on man-up opportunities. 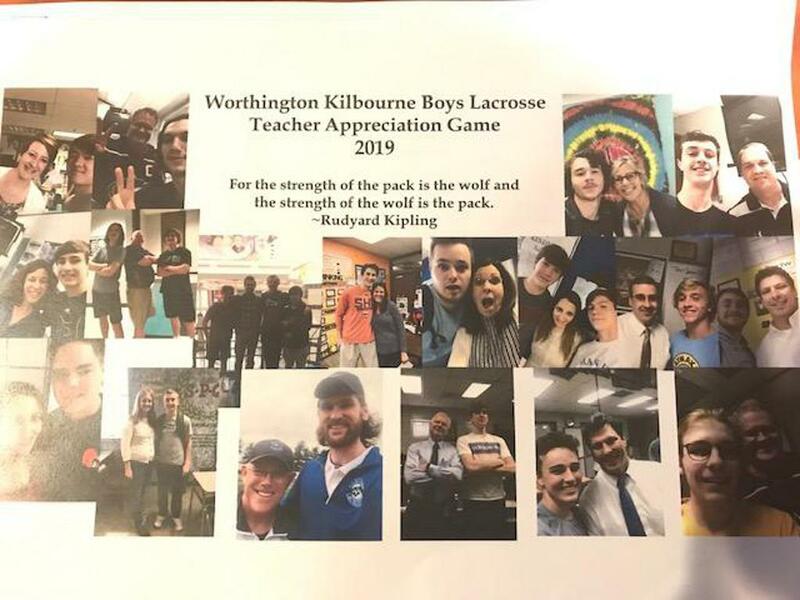 The game also featured Kilbourne Lacrosse's "Teacher Appreciation Night". Players all chose a teacher to honor for making a difference to them personally. Teachers joined players on the field before the game to be recognized and a special game program featuring "selfies" with student-athletes and their selected teachers along with comments from the players of what makes each teacher special was a great tribute for the night. Thanks to all teachers! After back-to-back games, the Wolves are now off until Thursday when they travel to Hilliard Davidson. Kilbourne JV posted a decisive 8-2 victory over the JV Delaware Pacers. Kilbourne JV is now 8-2-1 on the season overall.